Allowing McClean to walk could be a very good decision for West Brom's ace in the hole | The Transfer Tavern | Where football transfer rumours fly or die! According to the Birmingham Mail, West Brom winger James McClean remains a top target for fellow relegation sufferers Stoke this summer. The Republic of Ireland international has been with the Baggies since 2015 and has made himself a firm favourite amongst the Hawthorns faithful. The 29-year-old looks set to get caught up in Darren Moore’s squad overhaul following the club’s poor campaign last time out though and could therefore find himself turning out at the Britannia before long. Part of Moore’s plans to refresh his squad will hopefully include bringing through some of the club’s most exciting young prospects and giving them greater opportunities to experience first-team action. The departure of McClean would open up a gap in the squad that one of these youngsters in particular will be desperate to fill. The 19-year-old actually made his Premier League debut for West Brom back in April 2016, at the age of 16. His pace, dribbling skills and fearlessness in the face of vastly more experienced opposition defenders made sure the young Leko caught the eye from the off. Since his early introduction though, the England under-19 international has struggled to kick on in his club career. A loan spell with Bristol City last season gave Leko a taste of life in the Championship, but he was sent back to his parent club after only 11 appearances. At 19, time is still very much on the talented youngster’s side, but McClean’s departure would offer up the opportunity for the winger, who can play on the right or left flank, to make himself a vital part of Moore’s plans. Baggies fans deserve some excitement after last season and a breakout campaign from Leko would serve up exactly that. 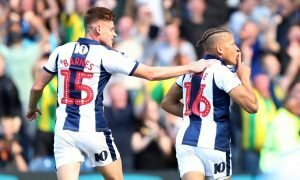 A talented young player making waves could also be what’s needed to spark this West Brom squad back into life, and a direct, attacking and inventive Leko could also help to get the best out of the likes of Salomon Rondon and Oliver Burke by providing goalscoring opportunities for them.